No rain fell through the night. Frequent awakenings revealed a patchwork sky of clouds through the open rain fly, drifting slowly across the blue black universe and a billion points of light. In the predawn we sipped our coffee, meditated into the fire and were mostly silent, moving about in easy company. asked him and he turned you down?” I later learned there were many ways to dance with a partner and that the dance floor might be in the desert, or on a river. Quigley’s voice and his request was as full of hope and anticipation as any boy attending his first dance. If ever there were an invitation to dance with him, this was it. Amazingly, a good night’s rest after yesterdays long hike was all we needed. Neither of us felt tired and it sounded like a good idea to me. We’d be in the truck the rest of the day, so a little exercise before the long sit would be welcome. Breaking camp, we organized gear and had the pickup packed by 7:30 am. Striking out across a now familiar landscape, we reached the high breaks of the canyon rim in just over an hour. The morning cloud cover held for Mike’s photo shoot. It was a very dark sky, but one without rain, and within twenty minutes we began our return. I was thirty to forty feet away from Mike and didn’t see anything at first. Coiled tight as its long fat body would allow, was a large rattlesnake, its head perfectly centered and resting against its outer coil. It appeared frozen in place beneath the pastel green leaves of spring sagebrush growing along the perimeter of a lava table. Among many stone pebbles of various colors, it lay perfectly camouflaged and dangerously cool. "... it lay perfectly camouflaged and dangerously cool." In my opinion, Mike was too close to take a photo, but he disregarded my warning. Detecting Mikes movement, the snake flicked his tongue several times, but otherwise remained completely still. Rattlesnakes have an exceptionally keen sense of smell, not only through their nostrils, but in olfactory sensors located in their tongues. In addition, heat sensing organs located in pits near each eye, allow them to see a heat-driven image of their prey much like an infrared camera sees an object at night. These pits are why they are also known as pit vipers. Feeling a sense of relief when Mike had accomplished his mission, we set a good pace back to camp, changed from boots to shoes and began the long drive out. Where rains had drenched the backcountry, roads were slick as axel grease. The truck glided from side to side as smoothly as an ice dancer, leaving deep trenches in the roadbed and accumulating a heavy buildup of clay on the tires, which flew up like stones when the accumulation grew too heavy to adhere, pelting the undercarriage. Skies were dark to the North with rain sheets streaming down. Building cumulus clouds in bright sunlight to the West provided a stunning spectrum of cloud color ranging from blinding silver to the darkest graphite. It was a beautiful drive to the tiny out-post of Rome, across unbroken landscapes and horizon lines. Jostled from my reverie as we bounced through a recent wildfire burn, heartbreaking for its stark and lifeless landscape, my attention turned to more immediate matters. A growling stomach. “I’ll split a hamburger with you at the Rome Cafe,” I suggested. “Sounds good to me,” Mike replied. She looked at Mike for confirmation. “I’ll have my own,” he countered. “Make that two then,” I revised. The hamburgers at the Rome Cafe are homemade and of good quality. It takes only a few nights in the backcountry to make them even better. Did you know that counting the buttons, or rattles, on the tail of a rattlesnake is not an accurate method for determining their age? Rattlesnakes acquire new buttons on their tail every time they shed their skin, which can be several times per year. 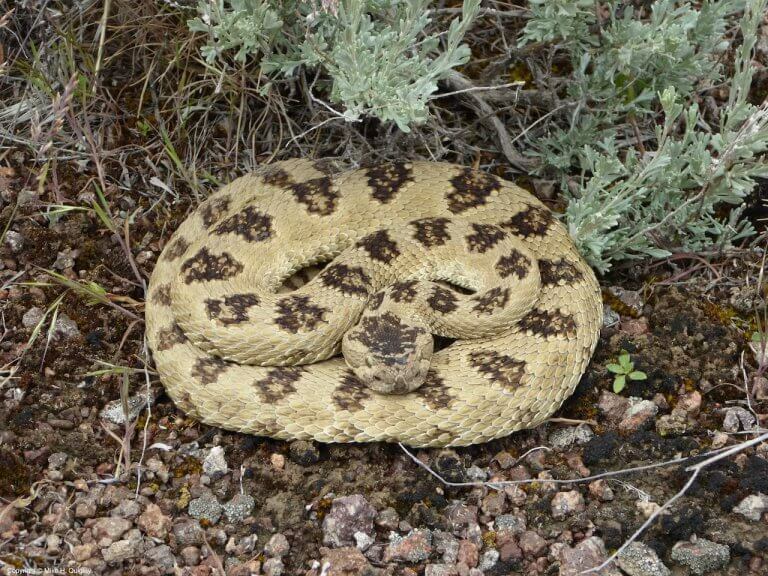 The Great Basin rattlesnake, a subspecies of the Western rattlesnake, can be found in great numbers in the Owyhee. Over the years we have observed that they are not aggressive animals. Although the venom in their bite poses a real threat to humans, they will try to avoid you. They have a lifespan ranging between ten and twenty-five years, and will grow to an average length of thirty inches. Female rattlesnakes bear live broods, with up to 25 baby snakes per brood. The snakes, while not popular, are a benefit to the farming community by eating many small rodents. For more information about Oregons’ indigenous rattlesnake, the Western rattlesnake, check out the Oregon Encyclopedia online. Hiking Antelope Creek – Part IV – Dangerously Cool, is the conclusion of our May excursion into the Owyhee backcountry in Oregon. When we returned in the fall of 2018, we explored a new tributary. Check back sometime for the next adventure. Or, instead of guessing when the next blog post is available, subscribe! After all, it’s free! You’ll find the subscription form on the main blog page, or click here. Our promise to you: No junk mail, just new post alerts. Period. Our promise to you: No spam, just new post alerts. Period. © 2019 OWYHEE MEDIA. All rights reserved.